December 1, 2010 Armstrong's Supply, whose retail lighting business was dealt a severe blow by the effects of Hurricane Katrina, has re-opened its state-of-the-art lighting and design showroom in New Orleans. The store is located at 3600 Orleans Avenue, at the corner of Bayou St. John in the historic Mid-City neighborhood. "We're thrilled to return to our original home in Mid-City" says Leslie Armstrong, Vice-President. "Our temporary location in Metairie allowed us to keep our brand alive after Katrina, but it was always our intent to return home to New Orleans. We hoped to create a store that was unique in our market, a fine lighting gallery that also features a great selection of home decor and gifts. We're pleased with the final result." The showroom is spacious and free-flowing, with attractive vignettes displaying chandeliers, lamps, mirrors, furniture, art and more. Armstrong and her staff take great efforts to search for distinctive merchandise to offer. "We want the shopping experience at Armstrong's to be unlike any other in the area" says Armstrong. Armstrong's opened a stand-alone store in the New Orleans suburb of Metairie in 2007 and has closed that location with their move back to New Orleans. Armstrong's Supply Company is a fourth-generation family business selling lighting and electrical supplies, founded in New Orleans in 1924, and operates three locations in Southeastern Louisiana. August, 2015 Edmond J. "Eddie" Stein, Sr. has retired after 46 years of service to Armstrong's Supply Company. 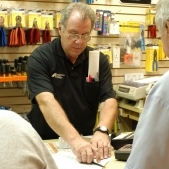 Eddie began his career with Armstrong's in 1969 as an aspiring electrical supply salesperson. During his decades of service he became known throughout the area for his friendly disposition, product knowledge, and attention to detail. "Eddie has been a shining example to scores of Armstrong's team members through the years" says Scott Armstrong, President of Armstrong's Supply Co., Inc. "He will be impossible to replace." Eddie's retirement was celebrated with a party at our New Orleans store, attended by a host of customers, suppliers, friends, family, and co-workers. Good luck Eddie!